Despite all the tools available online that help us manage our contacts, exchange contact information and connect with different groups, one aspect of networking hasn’t been shown the attention it deserves – the introduction. This is rather silly when you think about it, because most of the other elements of networking become irrelevant if people have a hard time meeting. Recommendations, overlapping contacts, these are signposts, but they aren’t the same as someone going to the trouble to introduce two people. Enter into the picture: Favour. 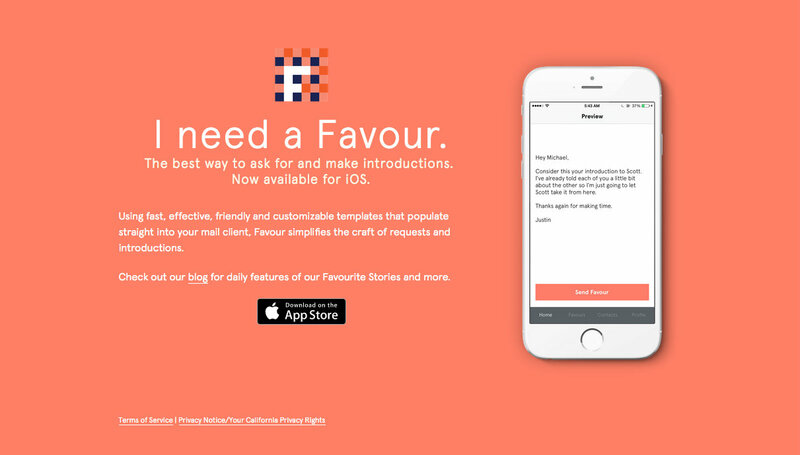 Favour is a mobile app that makes it easy to ask for introductions and to write and send them on the behalf of others. The borders between professional and personal interaction have mostly blurred, and, in general, introductions have become more informal. People are accessible to each other like never before. On the one hand, all of these trends make it far easier to introduce one another. On the other, the loosey-goosey rules of the game leave lots of room for anxiety. Favour looks to vanquish lingering awkwardness. Simple templates spare individuals the hassles of crafting introductions or requests for introductions. Short messages dispense with formalities (unless you need them, in which case there are templates for that as well). 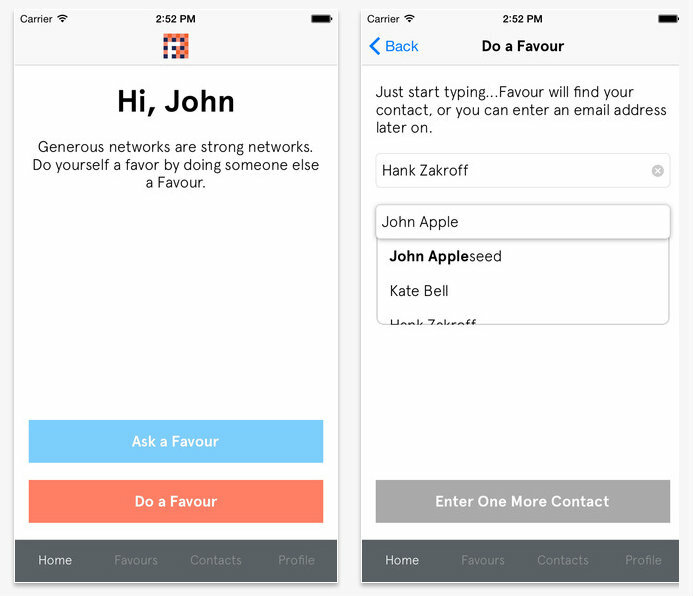 Favour finds existing contacts in your networks so that anyone can be emailed quickly, while the use of a recognizable service puts a friendly face on the entire process. Whether you’re looking to find mentors that can help advance your career or to find friends in the new city you just moved to, Favour is designed to wipe out the questions clouding how you should go about asking for intros. All you have to do is ask. Favour demystifies knowing how and where to start. Straightforward introductions and requests are already at your fingertips. This also means that it takes barely any effort to make introductions, so no excuse for not helping others out. As the team behind Flavour reminds us, “Generous networks are strong networks.” You do yourself a favor by sending someone a favour. Some people might think, “Introductions, what’s the big deal?” Exactly. Introductions should be painless and swift. If you’ve been wondering how to ask, now you know. If you’ve been hung-up on worrying about what you have to offer in exchange for introductions, well, Favour gives you an easy tool to reciprocate a good turn. If you’ve been fearful of how your requests will be received, the Favour blog has plenty of inspiration to push you into action. Ready to become a power networker? Eager to rack up good karma by dashing off intros for your friends and colleagues, or fast track your career by meeting key industry people? Learn more at favourapp.com or download the app from the App Store.